In life, you have endless amount of decisions you make each day. However, are they really your decisions to make? 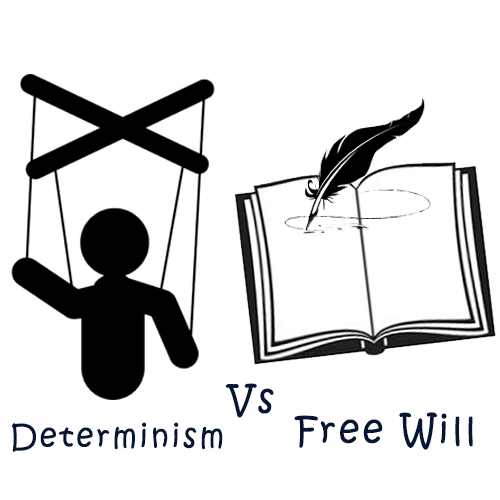 Do you have free will? Or have you been preprogrammed to make those decisions? Has it been determined before you even make it? These are two opposing beliefs; libertarian free will, that some human actions are freely chosen, and hard determinism; that all events are caused by past events, such that nothing other than what does occur, could occur. The thought of determinism that everything has already been decided can sound impossible. If you break it down into event causation; no physical event can occur without being cause by a previous physical event. This involves everything from getting out of bed to invading a country. You can’t fall from jumping if you haven’t jumped, you can’t jump if you don’t bending your knees, that wouldn’t of happened if there wasn’t something making you jump. However you can argue, a person propelled by a mind can start a whole chain of causality that wasn’t caused by anything else. Then philosophers ask the question where do these ‘free decisions’ that launch entirely new causal chains come from? Even our own thoughts can be put into a physical process of brain activity. The actions of a person can come down to 3 factors, their belief, desire and temperament. So if we put all the factors of the universe into a giant supercomputer, it could in theory predict the next second of the universe, and the next, and so on. So since the big bang everything that has happened or will happen can all be determined already. Believing in libertarian free will states that the action is free only if the agent (the person doing the action) could have done otherwise. Showing that you have options that you can freely choose at any moment. However even randomly choosing an option, asking someone to pick for you or flipping a coin is all just as determined as everything else. You can think of it as; a choice is the product of the brain,down to the most basic process brains work on atomic and subatomic level. So when it’s put basic brain activity works on the laws of biological, chemical and atomic interaction which is ultimately determined by the laws of physics. Even Einstein & Newton agreed that ‘The future is set, and we have no control on the outcome’. This may sound bleak, but it doesn’t mean you’re not affecting the future, you are, just in a more predictable way then you like. Although libertarian free-will say “we shouldn’t discount the legitimacy of our own personal, subjective experiences”. So if we feel so free, we should consider the possibility that we are. This is a loose piece of evidence supporting free will. Yet we are still trying to understand completely the role of consciousness. How can a bunch of non conscious particles create consciousness. No laws of physics govern that. On top of this, if we are in a String theory universe then every possible outcome for every possible moment exists. It’s just up to every agent (person) to choose the path it will go down at each instance. If string theory did exist there is a universe where you did eat that cake, and one where you didn’t, the role of consciousness could be that it’s up up to you to decide where each choice takes you. Even a puppet could feel free will if it enjoyed how the strings were controlling it, regardless if it had a say. To enjoy life without think about free will you need to at least believe you’re controlling the strings. Either way free will or not we come to the conclusion that our brains are in control of our future. So being consciously aware what you think about can literally change and control your future. “If free will exists, then our intuition about the physical laws are wrong. If free will doesn’t exist then our intuition about our existence are wrong.” – Daniel Do. This entry was posted in Amateur Pioneers Logic and tagged determinism, free, or, philosophy, story, watching, will, writing.